Every woman is born with a palette of healthy archetypes – The Girl, The Lover, The Chatelaine, and the Queen. Balance in this ancient code of womanhood brings along a balanced and wholesome life. Unfortunately, women often fall from the healthy archetypes to their shadow forms possessing either too much or too little of that particular energy. Archetypes and the shadow archetypes are like angels and demons of the female psyche. 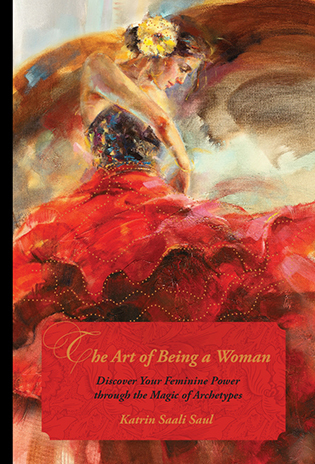 I wrote „The Art of Being a Woman” in hope that by acknowledging the shadows and expressing the healthy archetypes women can look at themselves from a new perspective and change their lives for better. woman integrates her archetypes, the better she masters different situations in her life. In addition, every woman possesses all four archetypes anyway. If these are not manifested in their healthy forms, the shadow forms crawl to the stage. Long-term exposure to the shadows, however, is exhausting to any woman and/or the people around her. There is a story that God created a man, then looked at him and said, “I can do better”. And crafted a woman. A powerful woman is the finest masterpiece of divine creation. How can you live your life so that the divine source in you wouldn’t dry up? So that the spark wouldn’t dim and you would grow your power with age? So that this power would feed your self-esteem and relations? How can you live your life to masterpiece? Read the book and you will find out. “The Art of Being a Woman” offers a glimpse into a world that we aspire to live in – take your time to reflect on its profound insights. Although the book is about women, there is something in here that everyone can relate to, man or woman. It is an amazing handbook for women who are not on the best of terms with themselves or need some help with their relationships. It will be a joyful read for those happy with their lives but yearning for some colour and spice. It’s an indispensable guide for men who would like to get to know and understand their mysterious Muse better. Saadaval trükitult: Amazon, Pilgrim, Rahva Raamat.